Sony finally brings its training smarts out of the labs and onto your head – and it's an impressive new device. The B-Trainer looks a lot like the W-Series of MP3 players Sony tried to foist onto the fitness market a few years ago, where the 4GB memory let you take your music with you without being hindered by wires or a phone. This model can track your heart rate, monitor your progress through GPS and tell you your stride rate. With six sensors and 11 data points, there's a hell of a lot more information that can be shoved out of your ears to help make you faster. 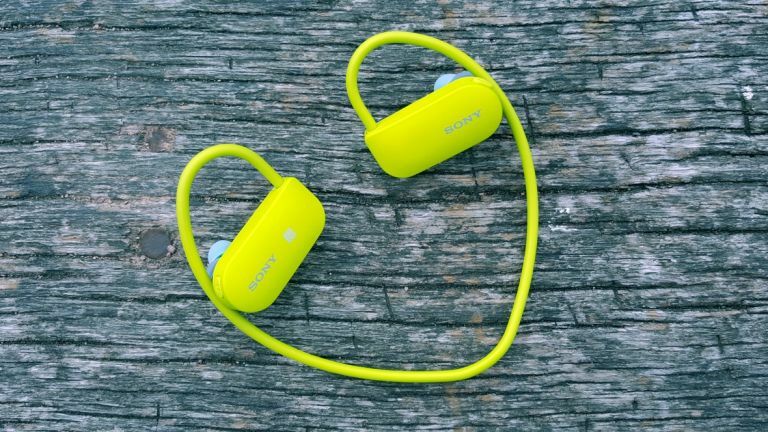 It's primarily aimed at runners, but is waterproof and can also be used when cycling and swimming if you want to listen to tunes when you're flapping about with the vague aim of trying to get fitter. The 16GB inbuilt memory can handle a bucketload of tunes and the improved audio playback uses Sony's audio smarts. While the B-Trainer doesn't require a phone to work, it does need a handset to let you download the data post run. We had numerous issues when getting it to sync with a phone, even when there were a number of them lying around. We soon got the feeling that we would have found a much smoother connection if there weren't millions of Bluetooth drones buzzing invisibly around. Speaking of a good connection, the Smart B-Trainer is quite a big device and it can be tricky to get a decent fit in the ears. The weight creates an issues for two reasons: firstly, the heart rate sensor requires a very close fit in your ears to work effectively, and we found we needed to push it in to the point of pain to make sure it could read data accurately. Secondly, the weight meant that on a longer 35-minute interval run the B-Trainer would start to fall out. For people with narrower ears this might not be a problem, but a spot of sweat and we had one earpiece dangling about like nobody's business. Using the B-Trainer was a mixed experience. We managed to get a decent 35-minute interval session done, where (fit aside) we got a good slug of data to help us understand what happened on the run. There are also two structured plans on the app - fat burning and endurance training - which help you train by measuring your heart rate. Go too slow, for example, and it will slow down the music to match your progress and encourage you to move faster. This only works with the tunes onboard though, so if you're a Spotify streamer you're plum out of luck if you want to train with the latest millennial wonderstar. The Sony Smart B-Trainer seems to be a decent device, with plenty of sensors onboard. You'll be paying a pretty penny for it - £230 is a lot, for the new runner especially - and with a lack of dedicated training plans you might struggle to find the motivation to keep going. But if you're an information junkie and want to get the most out of your headphones on a run (and hate packing a smartphone), the Smart B-Trainer is a good choice. T3.com Hands On Reviews are based on our first impressions. It's out early view after having used the tech in question for a short period of time. A full review will follow soon.